Jordan Henderson is determined to win trophies with Liverpool and England after falling short at crucial moments during recent years. The midfielder has lost finals in the EFL Cup, Europa League and Champions League with Liverpool since 2016, while he was part of the side that missed out on the Premier League title to Manchester City by two points in 2013-14. Henderson then made five appearances in England's run to last year's World Cup semi-finals, where they were beaten 2-1 by Croatia. The 28-year-old admits he now has an extra motivation to "put it right" by delivering silverware for club and country. 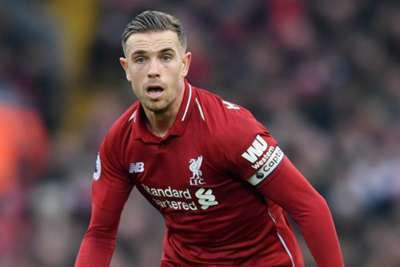 "It gives you even more motivation to then keep going, keep wanting to be in that position again to make it right and go that final step, really," Henderson told The Telegraph. "It's definitely an extra motivation that I use. Maybe I had a little taste of it playing in finals but I haven't really managed to win the big trophies, and that's the next step. "You always want to go on, you always want to go on and win. It's so disappointing that we haven't done that. And that gives you that bit more to want to get back there and want to put it right." Liverpool are two points clear at the top of the Premier League, having played a game more than champions City, and face Porto in the quarter-finals of the Champions League. Jurgen Klopp's side are in the strongest position to end their 29-year wait for a top-flight title since 2014 and Henderson wants them to embrace the pressure of the run-in. "When you play for Liverpool, there's always pressure, pressure to perform, expectation," he said. "Of course, that's the reason why you want to go there. We've put ourselves in a great position to compete. And now it's down to us to just keep going. "I always feel like that – my whole career I have always wanted to show how good I am and I have always wanted to improve. When you play for Liverpool and England, you have good players around you and you want to compete with the best."